Florida Bee Removal specializes in live removal and relocation of bees in Naples. In addition to bee removal (including Africanized bees) we remove wasps, hornets, yellow jackets as well as bee hive and honey removal. We are licensed and insured and perform bee removal service not only in Naples, but the entire state of Florida. Feel free to contact us with any questions you may have. Call Florida Bee Removal whether you need bee removal services, or perhaps you have a bee swarm or yellow jacket nest on your property and would just like additional information. We have been in the bee removal business over 50 years and enjoy every bee removal adventure. You are never a bother to us, we love the phone to buzz for bees! If you are located in Florida, you come into contact with bees. It’s just a fact of life. Sadly, you don’t know if you’re dealing with aggressive bees or non-aggressive bees until it’s too late. At Florida Bee Removal, our experts are highly qualified and properly trained in safe, effective bee removal techniques. We offer same-day service at a fair price. When we can safely and effectively perform it, Florida Bee Removal prefers to practice live bee removal of the bee hive if at all possible. When we have safely removed the live bees from your property in Naples, we turn them over to a local beekeeper so they may be safely managed. Our goal is not to exterminate bees, rather remove the danger of the bees from your property and keep them in their natural habitat so they can continue benefit our evironment. Other stinging and aggressive insects such as wasps and yellow jackets must be exterminated and removed from the site. THERE ARE SEVERAL TYPES OF BEE SWARMS: 1- REPRODUCTIVE; 2- ABSCONDIND; AND 3-ARTIFICIAL. THE REPRODUCTIVE BEE SWARM IS A NATURAL SPLIT FROM A PARENT BEE HIVE. IT HAS THE PURPOSE OF FORMING A NEW BEE COLONY WHILE LEAVING BEHIND SUFFICIENT BEE NUMBERS TO REPLENISH THE PARENT BEE COLONY. AN ABSCONDING BEE SWARM DESERTS THEIR BEE HIVE DUE TO UNTOWRD CONDITIONS ( LACK OF FOOD, FIRE, ETC ). BEE KEEPERS MULTIPLY THEIR COLONY NUMBERS ARTIFICIALLY BY DIVIDING UP THE BEE HIVE COMBS ( BEE BABIES, HONEY, POLLEN ) INTO “ NUCLEUS BEE HIVES. EACH NEW DIVISION IS SUPPLIED WITH AMPLE FOOD AND YOUNG, PRODUCTIVE QUEENS. PROFESSIONAL BEE KEEPERS DO NOT DEPEND UPON WILD BEE SWARMS FOR INCREASE. A BEE SWARM APPEARS AS A CLOUD OF INSECTS UNTIL IT LANDS UPON OR WITHIN AN OBJECT. ITS PURPOSE IS TO SPLIT FROM A “PARENT BEE COLONY “ AND TO FORM A NEW REPRODUCTIVE BEE UNIT. A BEE SWARM GENERALLY CONSUMES HONEY FROM THE PARENT BEE COLONY BEFORE SWARMING. THE BEE HIVE IS FASHIONED FROM SECRETED WAX. NECTAR, POLLEN , AND BEE BABIES ARE PLACED INTO WAX CELLS. In the photo, shown at left, Honeybees have ” putt ” themselves into a hazardous position on a Golf Course. 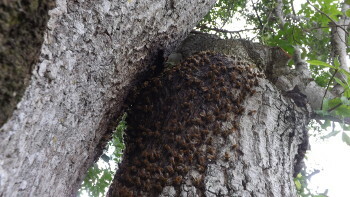 After much searching among the many oak trees, on this Country Club, the bee colony found a ” hole in one “. The golfers were teed off when the bees began to buzz them along the course. It became evident that it was going to bee their way or the fairway. Florida Bee Removal extricated the honeybees and took away their membership by excluding their residence with fiberglass tape and very strong caulk.